When a civilization is as old as the Egyptians, even tourism is historical in scope. Men who went a-conquering long ago may not have stopped to smell the roses, but they did find time to stop and see the pyramids at Giza; maybe Alexander the Great, Julius Caesar and the Emperor Napoleon wanted to see the edifices that housed the pharaohs. But a tourist with an agenda to see all that Egypt has to offer doesn’t have to end the tour at the resting places of the royal dynasties of Egypt. No one who visits Egypt is going to want to leave without first seeing the Great Sphinx, located in the neighborhood of the Giza Necropolis. The head of the Great Sphinx is said to be modeled after the Pharaoh Khafra, but with an anthropomorphic twist that added a lion’s body to what is the world’s the oldest known monumental sculpture. Don’t bother with a riddle; this isn’t that Sphinx, this is THE Sphinx. The Egyptian Museum in Cairo is a magnificent repository of precious Egyptian antiquities including papyrus, coins, and artifacts from the ruling dynasties. Check out the Royal Mummy Room where 27 former pharaohs rest in well-preserved peace. 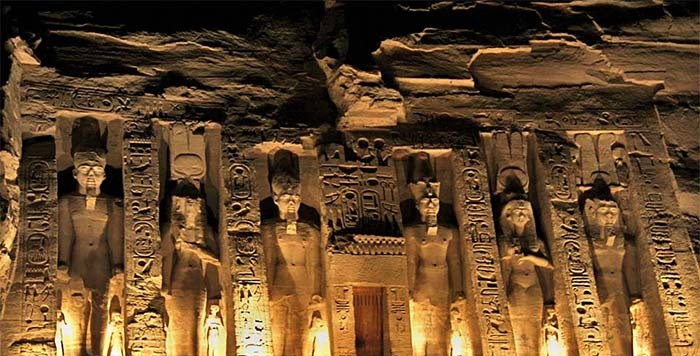 Rameses the Great and Queen Nefertari (not to be confused with Nefertiti—different pharaoh, different queen) were worshipped in style at the Abu Simbel temples where two temples were cut out of the mountain. This ancient building site is also a tribute to modern engineering: when the construction of the Aswan Dam threatened to drown the temples in the 1960s, the entire complex was moved to its present location on the bank of Lake Nasser in southern Egypt. If it’s good enough for James Bond, then the Mosque of Ibn Tulan should be on a tourist’s itinerary as well. Scenes from The Spy Who Loved Me were filmed in the 9th century mosque, which is one of the oldest mosques in the Egyptian capital. The Valley of the Kings, long since plundered for its royal treasures, nonetheless remains a popular site for visitors to Egypt. An upgrade in funereal tradition from the earlier pyramids, the Luxor showpiece, with its 63 tombs and chambers that range in size from petite to palatial, is a way to appreciate the elaborate traditions of the ancient Egyptians. It’s quite an impressive neighborhood; Tutankhamun, the Boy King, once tombed here. Egypt isn’t just buildings; it also has glorious nature to enjoy. The Red Sea is home to many varieties of sea creatures and coral, and offers a striking setting for diving. If you go to Egypt, you have to see the Nile River. Whether you travel in cruise ship style or on board a felucca, one of the traditional sailing vessels, you’ll be able to appreciate the heritage of the river and the country it serves.